$675.00 Award banner to a best military unit, circa 1970s	Military style star with hammer and sickle emblem and embroidered motto "For Our Soviet Motherland!" Size 5 1/3' by 4 1/4'. $895.00 Banner of a Naval Infantry unit, circa 1970s. In silk with gold fringe. A very unusual design, combination of a standard military flag and a Naval Ensign. 3 3/4 feet by 4 1/3 feet. An unusual opportunity to own a naval unit flag. $160.00 Ukrainian Collective Farm award banner in velvet, circa mid1980s. $280.00 Award Banner issued by a Spinning Mill / Knitting Factory in Ryazan Region of Russia, circa 1980s. 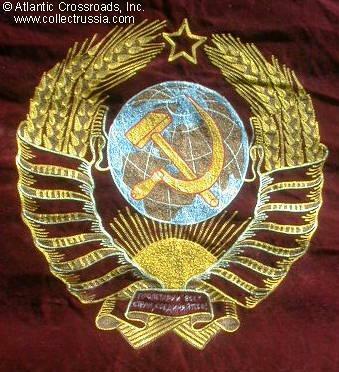 In maroon velvet with gold fringe, an "all-Union" type featuring USSR state emblem executed using an interesting combined technique: hand- embroidery, sewn-in silk, and applique pieces of durable plastic. In very good to excellent condition. $325.00 Young Pioneer Organizational flag embroidered with both Lenin's and Stalin's names, circa 1940s - early 1950s, Cotton with heavy silk embroidery, 45" long and 35" wide. $255.00 Young Pioneer Organizational flag in almost unused condition showing an embroidered version of the early membership badge, C the late 1950s. 45" long and 35" wide. $75.00 Wall Banner with the Code of Laws of the Young Pioneers of the USSR. A very uncommon Communist Youth item! In excellent condition. $35.00 Flag of the Young Pioneer League. In unissued condition. $20.00 Flag of the Octoberist Organization, 1970s-80s. $975.00 Propaganda Banner with Soviet State Emblem, circa 1937 - 1940. $69.00 USSR National Flag, Soviet Merchant Fleet type, dated 1988. A small or "launch" size, this one by two feet flag is ideal for a wall display. In excellent, near mint condition. $225.00 USSR National Flag, in wool bunting, as used by Soviet Merchant Fleet, dated 1989. Huge size, nearly 9-foot long! In good condition, showing minor moth damage but still fresh and very impressive. $35.00 National Flag of the Armenian Soviet Socialist Republic, circa 1980s. $30.00 National Flag of Azerbaijan Soviet Socialist Republic, circa 1980s. In nylon, standard 6'x3' size. In excellent condition. $30.00 National Flag of the Georgian Soviet Socialist Republic, dated 1987. $30.00 National Flag of the Kazakh Soviet Socialist Republic, circa 1980s issue in synthetic silk. Made during the Soviet era when Kazakhstan was still a part of the USSR. Excellent condition. $30.00 National Flag of Kirghiz Soviet Socialist Republic, c. 1980s. In synthetic silk. Excellent condition. $35.00 National Flag of Lithuanian Soviet Socialist Republic, a 1989 issue with attached manufacturer's tag. Approx. 6'x3', in synthetic silk. Excellent condition. $35.00 National Flag of the Moldovian Soviet Socialist Republic, circa 1980s. $30.00 National Flag of the Tajikistan Soviet Socialist Republic, dated 1989. In synthetic silk. Comes with attached original paper tag of a factory in Kiev, Ukraine. $30.00 National Flag of the Turkmen Soviet Socialist Republic, dated 1988. In nylon. Includes original paper tag of a factory in Moscow. Excellent condition. $39.00 National Flag of the Ukrainian Soviet Socialist Republic, dated 1988. $30.00 National Flag of the Uzbek Soviet Socialist Republic, circa 1980s issue in synthetic silk. Excellent condition. $70.00 DOSAAF Paramilitary Organization Award Pennant in velvet, circa 1950s-60s	. Shows colorful emblem of the "Volunteer Society to Support Army, Aviation and Navy" organization. $110.00 Honor Pennant to a Best Communist Youth Cell of the Military Unit #52701, awarded in 1982 on occasion of the 60th Anniversary of the Soviet Union. The unit was a military construction outfit stationed in Riga, Latvia. A highly unusual, relatively large pennant in red silk with multicolored embroidery. In good condition. $35.00 Large Pennant with Lenin's portrait for presentation to the winner of a socialist competition, 1980s. In red synthetic silk with gold fringe. Measures 15 ½ " x 23", larger than most other pennants of this type. Very good to excellent condition. $45.00 Small Pennant to a Best Labor Team, circa 1960s-70s. In red silk with gold fringe. An unusual piece with two tassels and embroidered red star. Excellent condition. $25.00 First Place Pennant for Tourist Camp Decoration, 22 & 23 May 1982. $10.00 Medium size Ukrainian Uniface pennant with Lenin's portrait, awarded to a best labor team, 1970s-80s. $120.00 Order of Suvorov, 3rd cl. streamers for a military unit flag, circa 1960s-80s. In excellent condition. $250.00 Order of Bogdan Khmelnitsky, 1st cl. streamers for a military unit flag, circa 1960s-80s. In excellent condition. An exceptionally rare unit award: out of 323 Order of Bogdan Khmelnitsky 1st cl. ever awarded, just 10 were issued to military units. In excellent condition but showing evidence of light use, not an unissued example. $120.00 Order of Bogdan Khmelnitsky, 2nd cl. streamers for a military unit flag, circa 1960s-80s. In excellent condition. $160.00 Order of Bogdan Khmelnitsky, 3rd cl. streamers for a military unit flag, circa 1960s-80s. In excellent condition. A very uncommon unit award: only 216 were awarded, far smaller number than units awarded with the 2nd class of the same decoration. $190.00 Military Flag or Standard Bearer's Sash and Harness, dated 1989. $175.00 Standard Bearer Assistant's Sash and Harness, dated 1990. Unusual and scarce item from the times of the military parades on the Red Square.